If you’ve been having trouble sleeping this week, you’d be well advised to head to cinema and catch a screening of WONDERSTRUCK. Yes, it’s that boring. Written by Brian Selznick (“The Invention of Hugo Cabret”, which was later turned into the Martin Scorsese film, HUGO) and based on his own 2011 novel of the same name, WONDERSTRUCK tells two stories of pre-teens who are separated by time. Each searching for love, they head to New York where their lives ultimately intersect. Ben (Oakes Fegley, PETE’S DRAGON) lives in rural Minnesota in 1977. Recently orphaned after his librarian mother (played by Michelle Williams, THE GREATEST SHOWMAN; MANCHESTER BY THE SEA) dies, he loses his hearing from being struck by lightning. Undaunted by the trauma, he decides to pack a bag and set off for the Big Apple to look for the man whom he believes is his father. His only clue is a worn bookmark he finds inside an old book of his mother’s from the American Museum of Natural History. The bookmark, which contains a message to his mother that ends with the words “Love, Danny,” has the name and address of a bookshop on the other side. Ben is convinced that not only is Danny his father, someone at the bookstore will know where to find him. 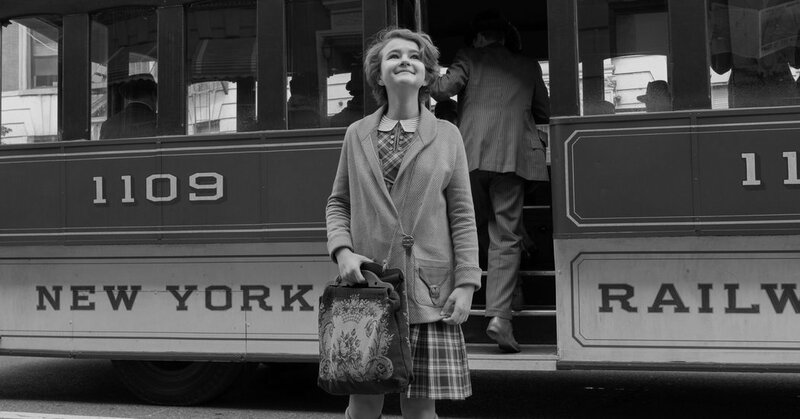 Fifty years earlier, in 1927, Rose (Millicent Simmonds, in her first movie role) is an introverted but equally determined deaf girl who lives with her wealthy but stern father in Hoboken, New Jersey. One day, Rose decides to catch the latest silent film starring her favourite actress, Lillian Mayhew (Julianne Moore, SUBURBICON; MAGGIE’S PLAN; STILL ALICE; DON JON), at the local cinema. Immensely moved by Mayhew’s performance, Rose also decides to pack a bag and set off across the Hudson River to find the woman, who is starring in a play there. The film jumps back and forth between the two stories as we follow both kids on their quests to find family who loves them. Eventually their paths meet up but it’s an excruciatingly long time before that happens and you may just be tempted to call it quits long before the closing credits roll. That’s what a few people at my screening did. WONDERSTRUCK is directed by Todd Haynes (FAR FROM HEAVEN, which also stars Moore), who suffers from putting more effort into the style of his films than into the substance. The same can be said of his last film, CAROL. The result is a film that has meticulous set and production design but is lacking in story delivery. 1977 New York hasn’t looked this authentic since, well, 1977. The garbage, the grit, the seediness and the clothes all evoke that period of time when a trip to Times Square was a risky venture at best. Rose’s story, too, also beautifully evokes the time when horsecarts and carriages ruled that city’s streets. Shot in black and white with only an era-appropriate musical soundtrack playing in the background, this story is not only reminiscent of the silent movies of that time but also reflects the soundless world that Rose lives in. While both stories are impressive in their craft, their tonal difference doesn’t quite mesh and the constant volleying between the two leading up to the inevitable intersection is frustrating at best. Unfortunately, some highly implausible situations that the young characters face only serve to distract from the actors’ performances and, in the end, we’re just left with an unmemorable heap of blah. That’s why there’s no need for you to rush out and see it… unless you need the sleep.